I wonder how many Oscar voters who check off Moore’s name on their ballot will even bother watching their ALICE screeners. The subject matter is certainly daunting, and may even hit too close to home for certain elderly Academy members. It’s the same reason that, despite its awards patina, husband-and-husband co-directors Richard Glatzer and Wash Westmoreland’s movie surely faces an uphill battle at the box-office. 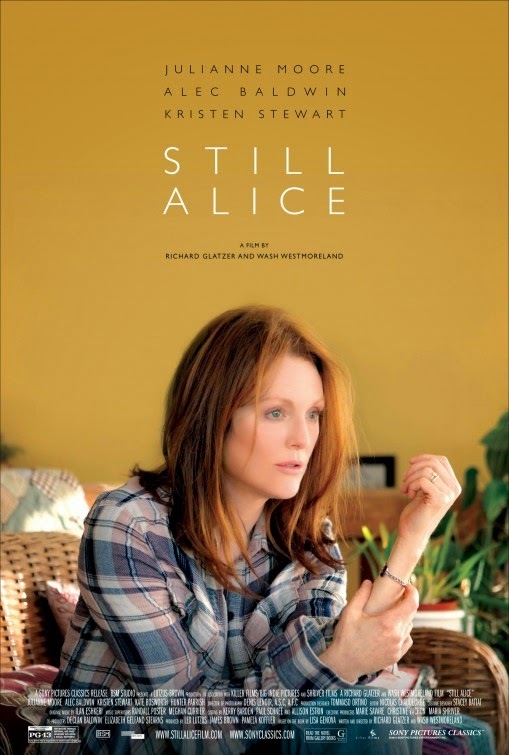 I’d love to say that STILL ALICE isn’t depressing and that Moore’s performance makes the pain seem worthwhile somehow. Yet, there’s no getting around the fact that watching a brilliant, formerly vibrant middle-aged woman like Moore’s Alice Howland slip deeper and deeper into dementia until she practically becomes invisible, even to herself, is excruciating at times. So no, this is not an “easy” film, but it is a good and solidly, cleanly crafted one. Whether that’s enough to make it a hit remains to be seen. A case could be made that ALICE might have been a better fit on a premium cable channel like HBO where equally “difficult”—and difficult to market—movies like Ryan Murphy’s THE NORMAL HEART or Lisa Cholodenko’s OLIVE KITTERIDGE have found large, appreciative audiences. Certainly there’s nothing about it that wouldn’t play just as well on a television screen. Glatzer and Westmoreland (whose previous collaborative efforts include QUINCEANERA and THE LAST OF ROBIN HOOD) have never been the most visually adroit filmmakers. And the deliberately small scale of their movies makes them more tube than big screen-friendly anyway. Adapted from Lisa Genova’s well-regarded book, the film tells a fairly straight forward story in an equally unfussy manner. As Alice begins to experience memory loss/disorientation and starts fumbling for words in the middle of a classroom lecture (a truly Kafka-esque nightmare for a linguistics professor), it becomes increasingly clear that something is amiss. But since Alzheimer’s is a disease more commonly associated with people several decades older, Alice is blindsided by the diagnosis when it arrives. Moore is simply a wonder to behold. In a remarkably subtle performance that’s all the more impressive for its utter lack of sentimentality, she allows us to witness Alice losing more and more of her identity until all that’s left is a blank stare peering into the abyss. The beauty of Moore’s acting is that she never loses sight of Alice’s soul, if such a thing even exists. Thanks to the brilliance of Moore, you’ll want to believe there is. 3 out of 4 stars.